Then they which held Jesus, led him to Caiphas the high Priest, where all the Priests & the Scribes and Ancients were assembled together and Peter followed him afar off even unto the court of the high Priest, & going in he sat with the servants at the fire that he might see the end. And the chief Priests and the whole Council sought false witness against Jesus that they might put him to death, and they found not, for many spake false witness against him, and the testimonies were not convenient: and last of all there came two false witnesses, & they said we have heard whimsy, I will dissolve this temple made with hand, and in three days will I build another not made with hand, and their testimony was not convenient. The high Priest therefore rising up asked of Jesus, saying unto him answerest thou nothing to these things that are objected to thee of these? but Jesus held his peace, and answered nothing. The principal persons of Israel, by commandment of Queen Jezabel brought forth two false witnesses against Naboth a just man, to condemn him to death. 1. False witnesses rising against me asked me of those things which I knew not. 2. 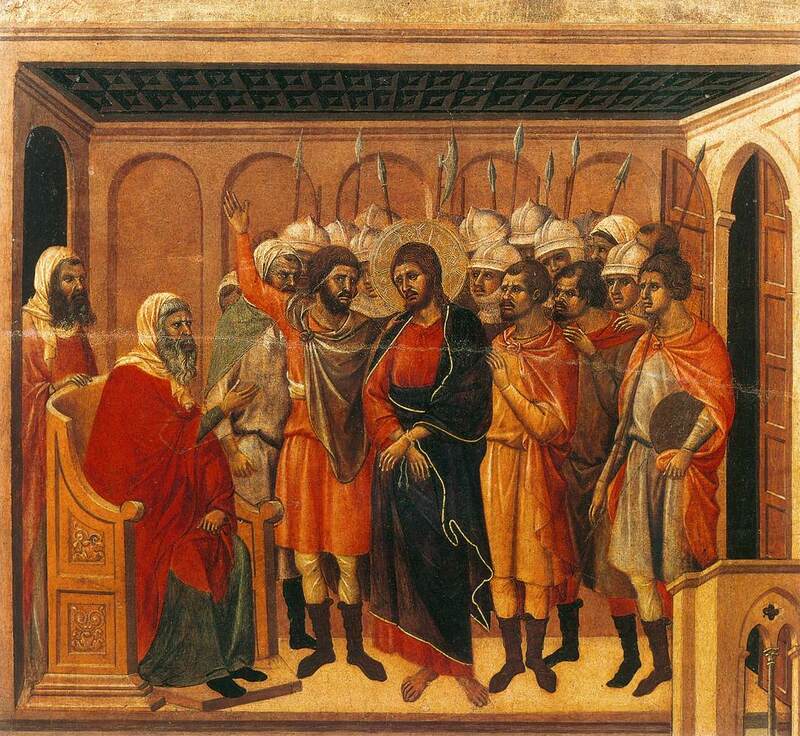 The sinner and the fraudulent person have opened their mouths, and have spoken against me with deceitful tongues. 3. I have redeemed them, and they have spoken falsely against me. 4. I am made like to a man that heareth not, and have not what to answer unto the things which they object against him. 5. And I will make thy tongue to cleave to the roof of thy mouth and thou shalt be dumb & like to a man which knoweth not how to reprehend because this is a people which provoked my anger. 1. Annas sendeth Christ as worthy of death unto Caiphas the chief Priest. Follow now O my soul thy Spouse, who to espouse himself unto thee hath taken and supported for thy love all these labors and travails: Consider this mournful procession, and see with what inhumanity and cruelty those sons of the Devil do lead or rather haul or draw the most meek Jesus. The Scribes & Pharisees together with those wicked Ancients were assembled in the house of Caiphas, full of wrath & disdain, and swollen with pride and envy against our Savior, and because they were assembled in the name of Satan to shed the innocent Blood of Christ, therefore in the midst of them was also that malign spirit, which egged them forward to all cruelty and malice. Consider how he being come amongst them, with what despite they received him and with what terrible eyes they beheld him: O how greatly did those proud hearts rejoice, to see our Savior stand before them so much abased and dishonored, disdaining for to speak unto him save with sharp & injurious words. 2. Consider how the God of Majesty, stood in manner of an innocent lamb in the midst of that malign council, as amongest most ravening wolves, with his hands bound, with a rope about his neck, with his face (by means of the strokes which they gave him) deformed and wane, and with eyes cast down upon the earth, on all sides villainously used and dishonored. And albeit the most meek Jesus suffered all this for our love, with profound humility and patience, and with a thirsty desire of drinking that bitter cup: nevertheless if could not be otherwise, but that his most tender and sweet heart was so much more moved and offended with the malice and ingratitude of that people by how much greater his own innocency was. 3. The Jews being not able to find true testimonies against Jesus, for that he being truth itself was impossible to find in him ant falsehood: they sought out false witnesses. This malicious people desired to put Christ to death, not because they found him guilty of any fault, but for that they had resolved to kill him, and have him out of their sight. They sought some color & presence that they might seem to do it justly. Where, first, consider, how far the malice of a sinner extendeth, since that to fulfill his inordinate desires, he presumeth to lay hands on God, & would if it were possible dispatch him out of the world. Secondly consider how far otherwise Christ dealt with the Jews, then they did with him. For they being full of envy, after they had received infinite benefits of him, sought pretenses to condemn him: Contraries Christ being full of charity after so many injuries received of them when he was nailed on the Cross sought excuses to his Father for to deliver and save them. 4. Consider how virtue and verity defendeth itself: For although the Jews had deadly hatred against Christ notwithstanding so great was his innocency, and so faultless his life, that no one durst impute any sin unto him: which thing also our Lord permitted with great mystery. First for the good of those selfsame enemies of his, that they knowing themselves to have no cause of condemning him, might acknowledging their error be more easily converted. Secondly for the good of his Church, to the extent that his innocency being made manifest according as the Prophet foretold of him. Quod iniquitatem non secerit, neque dolls surit in ore eius: she should be more confirmed in the faith of his Godhead, and of the mystery of his death voluntarily suffered for us. 5. Consider how this proud Priest finding no sufficient testimony to condemn Christ. assailed with wrathful words, to induce him to speak some thing that might be reprehended, but he held his peace & answered not. Blessed Jesus held his peace, first for justice, because neither the person, nor the things which were spoke deserved answer. Secondly for mercy: that he might not give them occasion since that they did persever in their malice to sin more greviously. Thirdly for wisdom, because he knew full well that whatsoever he had said should have been calumniated of them, neither would they have accepted of his defense: He held his peace likewise for his charity, for that he coming to suffer for us, would not excuse or defend himself, but with patience support all the accusations, despite, and reprehensions, which our sins deserved. Lastly he held his peace as a true Phuyscian which came to deal our infirmities with country remedies: For Adam being justly blamed excused himself. and by his excuse increased his fault: Christ contawise being innocently accused, held his peace and made no excuse, which he did to the extent that with his innocency & unjust accusation, he might purge the fault of Adam, and by holding of his peace when he was accused he might satisfy for the excuse of Adam. Thou shalt pray unto Christ our Lord, since that he would for thy love, be falsely calumniated, to grant thee grace always to walk in his service with truth & that thou maist never use any falsehood towards thy neighbor in word or judgement, but to have a special regard of the honor and good fame of every one, as of thine now, and contrawise with patience and humility support for his love what soever may be done or said against thee, acknowledging thyself for thy sins to be worthy of all shame & punishment. 1. They which excel others in dignity gather themselves together against Christ to out him to death: contrawise the multitude and the more simple sort follow & embrace his doctrine. Whereby we may well how many dangers and occasion of ruin are found in high estates, and how more securely live, and more easily are saved the humble and simple men. 2. We ought for imitation of Christ patiently sustain calumnies and false witnesses, without defending ourselves or reprehending of those which speak falsely against us. 3. If walk aright in the presence of God, we ought not regard the voice of the ignorant people. neither the tongues of evil speakers, but rather make them answer by holding our peace & with patience overcome their malice. 4. They seek false witnesses against Christ, who seek excuses for not obeying the Divine inspirations, for not doing any work of virtue whereunto they are bound: and they likewise which detract and reprehend those which give themselves to virtue & perfection of life. 5. When any both accuse and reprehend us in wrath and choler, we must rather hold our peace and support it than answer or excuse ourselves, for that with the one we shall quench the anger of the evil speaker, and with the other we shall edify our neighbor. 6. When we are falsely calumniated and accused, let us comfort ourselves with the example of Christ, and let us remember the words which he spoke. Blessed are you when men shall revile and persecute you, and speak all that nought is against you, untruly for my sake: be glad and rejoice, for your reward is very great in Heaven.